The Balvenie Single Barrel Traditional Oak is characterised by subtle spices and rich honeyed sweetness. Malt Master David C. Stewart MBE only selects casks of whisky for bottling that have the character he expects of Balvenie matured for 25 years exclusively in American oak. However, no two casks will ever produce an identical single malt. As such, this 25 year old single malt whisky from a Single Barrel Traditional Oak Aged is unique and no more than 300 bottles will be filled from any one cask. This is reflected on the bottle label – hand numbered and carrying the distillation date, bottling date and cask number in which the Scotch whisky was matured. 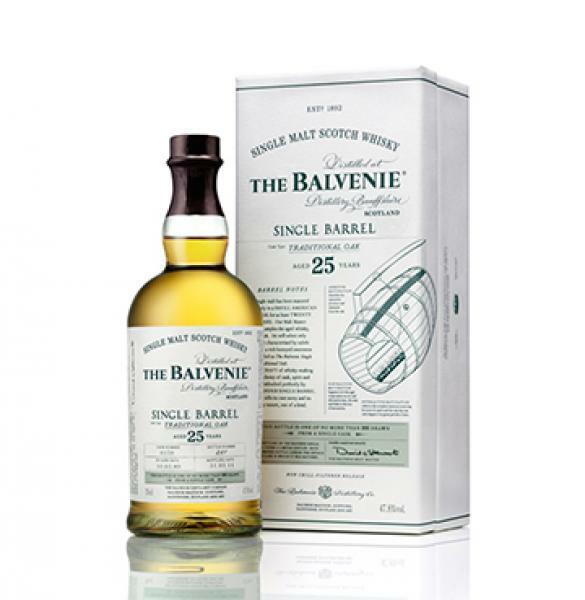 The Balvenie Single Barrel Traditional Oak Aged 25 Years is a non chill-filtered release with an ABV of 47.8%. Nose: Deep, mature and rich with overtures of oak and spice. Palate: Honeyed notes overlaid with gentle spices and silky vanilla oakiness. Finish: Rich, honeyed and spicy.